The French and 'love' go together like Batman and brightly coloured sidekicks, so it only makes sense that the online portfolio of this 28 year old male french artist, is dedicated to... well, cheesecake. Still, while a portfolio dedicated to the female form is never a bad thing, it's the pieces where Cedric pulls back on the T&A and focuses on things like the emotion of the characters, and adding art nouveau-esque linework, that the fireworks really start to happen. With a fixation for Poison Ivy and Zatanna, the guy who usually runs by the codename of Stealth online, is as skilled with a pencil as he is with Photoshop. From comics to video games, and all points inbetween, you can catch more of his great work on his deviantART page, his blog or over at ComicArtFans.com. Cedric is great @ the female form. 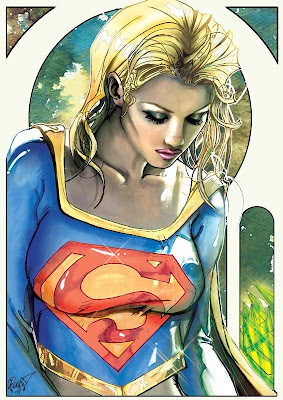 He sure has a way with the ladies SK - that Supergirl piece is amazing. Thanks for the link to the sweet interview as well - always good to find out more about the artists involved, and thanks for stopping in on IADW! My goodness gracious where has this posting been all my life!? These are some really nice renderings! I think the posting editorial pretty much says it all. I need to start getting back into drawing and painting women like i used to. Yeah I need to get back behind the pen too David!